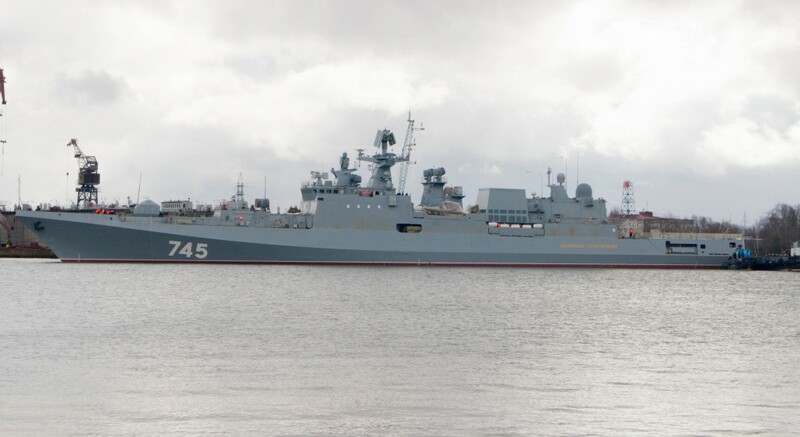 According to the press officer of the Yantar Shipyard in Kaliningrad, the Admiral Essen frigate, is about to start its manufacturer’s trials and put it out in the Baltic Sea for the first time. The Admiral Essen is the second frigate of the Admiral Grigorovich-class (Project 11356) and according to “Navy Recognition” was recently moved from the shipyard to the acceptance facility in the port of Baltiisk, in order to start manufacturer’s trials and later conduct sea trials. The Admiral Grigorovich-class frigate is based on the Talwar-class frigate, which was designed and built for the Indian Navy. Six vessels of the Talwar-class frigates were ordered by the Indian Navy and built at Yantar Shipyard in Kaliningrad during 1999-2013. The two Admiral Grigorovich-class frigates will be assigned to the Russian Navy’s Black Sea Fleet, while three more vessels are under construction and another one is planned to be built. The first three ships of the Admiral Grigorovich-class are equipped with Ukrainian made M7N.1E gas-turbine power plants. Since the two countries have terminated their military and technical cooperation because of the war in Eastern Ukraine, Zorya-Mashproyekt Company that manufactures the M7N.1E gas-turbine power plants, will not deliver to the Russian shipyard in Kaliningrad the remaining three gas-turbine power plants for the Admiral Butakov (laid down on July 2013), Admiral Istomin (laid down on November 2013) and Admiral Kornilov frigates. Although the Russian engine manufacturer Saturn, is developing a new gas-turbine power plant for the three last Admiral Grigorovich-class frigates, the first engine will not be ready before 2019-2020. This prospect does not suit with the plans of the Russian Navy and one of the proposals of the Russian Ministry of Defence and the Federal Military Technical Cooperation Service is to offer the three ships for export. Possible buyer of the three last frigates is India, since its Navy operates six similar vessels and the Indian Ambassador to Russia Pundi Srinivasan Raghavan, has said that New Delhi would do its best so that the Russian frigates are built for the Indian Navy. According to the Indian Ambassador in Russia, his country will try to resolve the problems with the Ukrainian power plants required for the three last frigates.